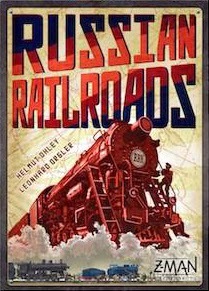 Russian Railroads was recently released by Z-Man Games and Hans im Gluck at Essen 2013. It flew under my radar as I had assumed from its box art and stated category on BGG that it was a train game. Train Games = Major Dislike for me. Having eventually checked out all we wanted to do, Dion and myself decided to head on over to see how good this “Game of the Fair” was. Dion got a demo in while I watched from the sidelines. The result ? He loved it ! Game of the Fair for him. Could it be that Russian Railroads is all its hyped up to be ? I got a play in last Saturday at Eric’s place – a 4 player game involving Jillian, Eric, Dion and myself. Read on to see if its captured my attention as well ! 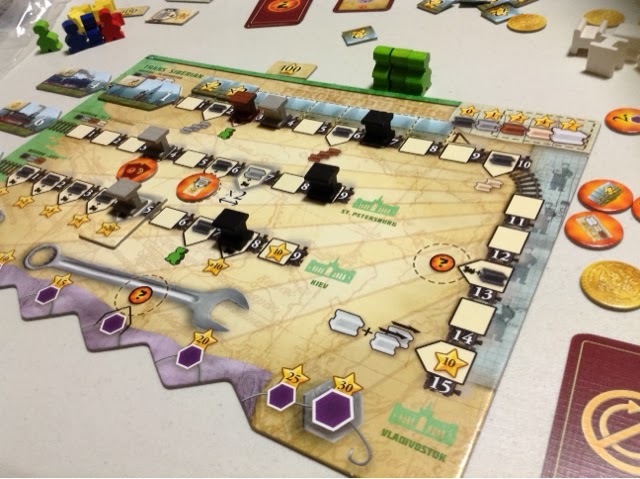 Russian Railroads ( RR ) is a train themed worker placement game. Players are building up a train empire that… you know what, the theme is really non existent. Let’s just forget about that. What happens in RR is that players are trying to build up a points engine that will inch them to victory after 7 rounds. Did I say inch ? Sorry I was joking. Perhaps in sync with its theme, the victory points come fast and furious in RR ( a winning score is somewhere in the region of 350 and above ). Players want to build up a points engine that will power them to victory after 7 rounds. 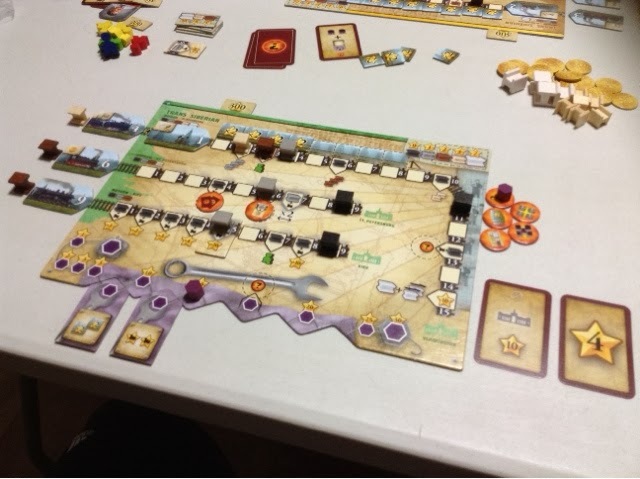 As per all worker placement games, players play out each round in similar fashion – place workers, get resources, do stuff with resources, score points. Nothing is really different in RR. Each player has their own player board that helps them to map out what they have done and how much points they will score after each round. The one interesting thing in RR is that the player board is not merely a way to store obtained resources or to show how far along a player is in the game, but it is actually a dynamic board where you may amend properties that help to determine the points you can score versus what you are able to score. This may sound confusing but it’s actually pretty simple. Scoring in RR is divided into 2 main processes. The first one is where players are laying different types of rails/tracks that determine how many points the player can optimally score per round. The second process is the important one; the type of locomotive you purchased decides how much of the optimal score you can pocket per round. So players are trying to fine tune their strategy so that with fewer moves they can obtain the necessary combination to haul in the big points, but at the same time they want to do so as early as possible so that the big points count in the long run. Before going any further, I just want to say that I won’t be able to – and will not try to – explain everything that can be done in RR. It’s not only because there is so much going on, but also because without adequate pictures of everything, most of what I say won’t make any sense. Although RR seems to be a typical worker placement game, it does have some areas of the game that are really interesting ( or pretty interesting enough ). Firstly, the game board. Most of its areas are fixed with the exception of the engineer tiles. These tiles have 2 purposes – end game scoring for majority holding, and public & private worker placement areas. When not yet purchased, the tiles work as public action spaces for players to use, once purchased, that space is now for the buyer’s private use only. These spaces are pretty good but hardly overpowered. It makes the game somewhat different but I won’t say by very much. Another interesting feature is the player driven bonus abilities. This is possibly my favorite feature of the game. Players each have 7 tiles that give them a one time bonus in game. The trick behind it is that the bonus takes effect when a player has met certain conditions ( lay rails to a certain location, power your manufacturing ability, etc ). Throughout the game, a player may only execute 4 of the 7 abilities. So the decision point is what ability you want and when you want to execute it. Once you meet the criteria, it must be acted upon immediately. So if you get it too early, you may waste your given ability. This is very neat. I very much love this part of the game. Most of the abilities are extremely useful, and the timing of when it’s done is absolutely critical. In a somewhat meta way, one of the abilities makes the game even more interesting because it gives you a special unique ability and the chance to choose your own end game scoring bonus. Mind blown. This particular ability lets you choose from 5 face-up unique ability cards on the table. These are first come first serve and are extremely useful. Very. Tremendously. Not only that, it affords you the chance to choose what type of end game scoring bonus you want to aim for. You will be able to go through the deck of end game scoring cards and pick what you think you will be able to achieve best. I like the freedom of choice in this aspect and how you want to get first pickings before another player steals what you want from under your nose. That was a very nice touch. Definitely better than fixed end game scoring prerequisites. The last thing I want to mention are the locomotive tiles. 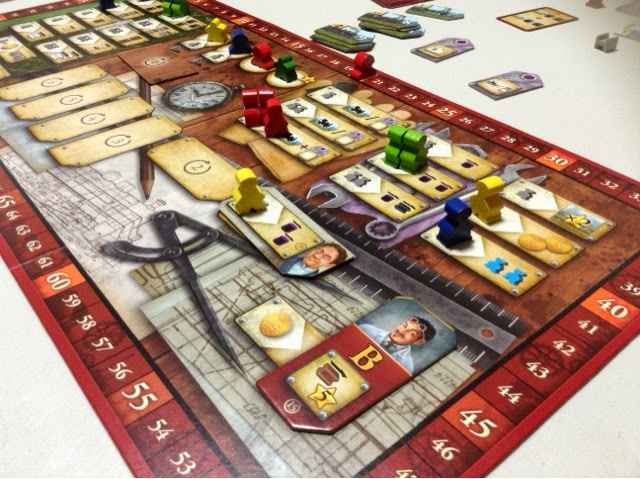 Like the engineer tiles, they serve 2 functions – use them for scoring markers or use them for their factory bonuses. The locomotives are the main way to keep your engine effective, so players are jostling to get the best one without leaving their opponents with a better one ( each player must take the lower numbered ones first ). Alternatively, these locomotives may be used instead for a bonus when the player manages to activate them via a manufacturing track. The bonuses are pretty neat and useful in certain situations. But, they are controlled throughout the duration of the game which would fall under a negative for me. Wow this is a long post. As mentioned above, the locomotive bonuses are timed by the game. So the greater effects are only found near the end of the game when the higher trains are available. That is quite a shame. A lot of the bonuses can really make the game feel different when activated early. It doesn’t look overpowered so I wonder how much opportunity is wasted in restricting this part of the game. I also have concerns about the replay-ability of RR. In essence, there are only 4 tracks that a player may build his/her points engine from. The Vladivostok track rewards players in multiples for having different types of rails. The St Petersburg is a low scoring track but gives you the best chance for activating your in game bonus abilities. The Kiev track rewards commitment to the track and can really pile up the points if done correctly. And the final manufacturing track is the steady producing track which affords you to use the locomotive bonuses while also allowing you to score twice if you so choose to take that route. I wouldn’t call 4 tracks a lot of replay-ability as in each game you are mostly utilizing a combination of 2 of the 4 tracks ( or maybe more ). I love games with multiple paths to victory and RR might fall short of that after a few more plays. The only way to enhance its replay-ability is if you are self driven. What I mean by that is if you are the kind that challenges yourself to dare to do something out of the box. Execute a different strategy that may seem like folly but could still maybe pull out a shock victory. I can think of one or two strategies that I may want to try for the fun of it, but I am near certain they will lead to my demise. But still, there could be some hope. I'm very torn after my first play of RR. I was very thrilled by it in game. More than I expected to be. The choices were interesting and the board spaces were tight. Pretty much what you hope for in a good worker placement game. The way you build up your engine but are only able to score a handful of them because of your lack of proper locomotives is also a very nice engine management system. There is some tension to be found in the game mainly because you want to get your engine up and running ASAP so that you can runaway from your opponents and make them panic and take unnecessary risks. However, the one thing that was strangely missing in RR ( because it is a worker placement game ) was the feeling of having to get an action FIRST. You do want to go first to have the wealth of choices, but that's mainly because you want to be able to do more things before it gets blocked. But I never ever got the feeling that I want to get a particular action space before anybody else. In short, the competition for spaces is not direct. People will indirectly block you because you both want the same thing, but its not because they wanted the thing so that you can't have it ( which to me is what makes a worker placement game great and lively ). This leads to a lack of tension in an otherwise very good game. RR is a game I am considering picking up when it comes out in its general release. But I also fear that it would turn out to be samey after awhile and considering the time it takes to play it, it may not fit well in my group and also in my collection of games. I thoroughly enjoyed my play of it and it gave off a vibe of being Feld-ish in terms of the numerous things you would love to do and how they are all supremely beneficial to your cause. As i said, I am very torn in my opinion of RR. As of now I will like to pick it up. But when its finally release in December, I won't be surprised if my opinion of it has changed by then. Jon & eric, May I check how long was the game play for RR for you people. Our 2 games (for 3 players) are like 2.5 hrs (yes, for 2 games), we know we we play some rules wrongly but I doubt game duration will increased much even if we corrected it. At most one game takes 90 min, way below the 2hr duration.